We’ve been housing our four new chickens in the greenhouse while we waited for the coop to be built. Luckily, the weather has been mild and it hasn’t been too hot in there. Dylan from ChickenRanching.com came over yesterday and built an elevated shed-style coop for us with an attached, enclosed run in our side yard. There is a large opening on the back side that we can use to fill their feeder and collect eggs (after they actually start laying). We chose the side yard location for a few reasons: 1. It’s one of the few completely level parts of the yard, which makes it an easier build location, 2. We wanted it to be pretty close to the back door so we can easily get to it for feeding, watering, and collecting eggs, and 3. This is the only area of our yard that is completely fenced in. This means we can let them out of the run during the day to forage in a larger space, making them somewhat free range. Before we let them free range, however, we will need to cut their wings. While in the greenhouse, the two Australorps (the black chickens) easily flew out of the top of the open greenhouse dutch door. Dylan gave us a suggestion about clipping their wings at night when they are sleepy. I also found a good wing-clipping diagram on the Backyard Chickens site. 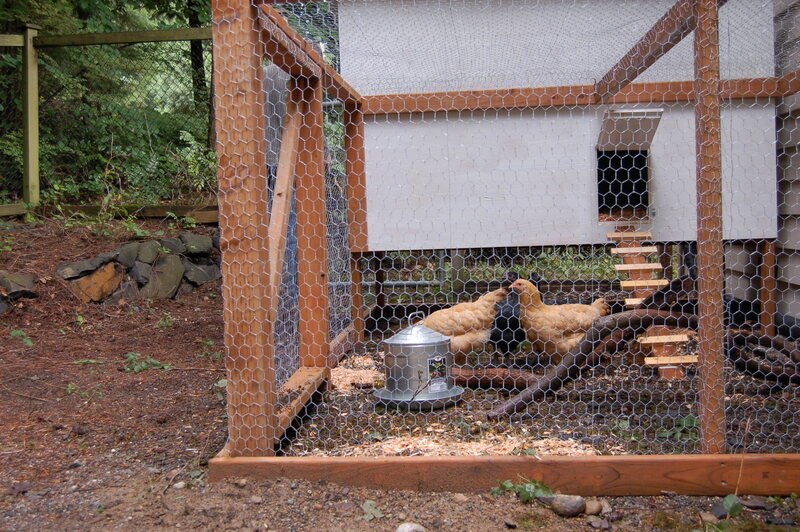 Backyard Chickens also recommends the deep litter method for chicken bedding and bedding cleaning. Since this method only requires cleaning out the coop once or twice a year, I’m willing to give it a try! To get the chickens into the new coop, I had to move them from the greenhouse. After a good ten minutes of trying to catch the chickens (to put them in a dog carrier for transport over to the greenhouse), I decided there had to be a better way. Chickens are surprisingly fast, and running after them and lurching to catch one was making me feel pretty dumb. It’s pretty sad when you are feeling outsmarted by a chicken. Lily, my helper in this endeavor, and I decided we would come up with a plan. We devised a chicken “run” by strategically placing the large lemon and lime tree pots in the corner of the greenhouse. We then set up the dog carrier so that we could chase the chickens behind the the pots, through the run, and into the dog carrier. This solved the problem pretty quickly and we soon had the chickens in their new coop. Now that they are in their coop, we are hoping they will figure out how to walk up the ladder to get into the coop. We sprinkled chicken feed on the steps of the chicken ladder and put their food inside. One chicken pecked it off the steps and didn’t step foot on the ladder. Derek even went out, caught a chicken, and plopped it through the coop door. It popped out as quickly as it went in. I suppose if we keep their food in the coop, they’ll eventually figure out how to get in there, at least I hope so. Update: Nancy, in comments, suggested we try moving the chickens from the run into the coop at dusk. She was right! At dusk, the chickens were very docile and easy to grab. Derek went into the coop and quickly grabbed each one and plopped her in the coop. They figured out the roost and slept there all night. We opened the coop door this morning and it took a bit, but they figured out how to walk down the coop ramp and are now pecking away in their run. Another update: The chickens go into their coop at dusk without my assistance. All I have to do is close their coop door and they are safely set for the night. Super easy! 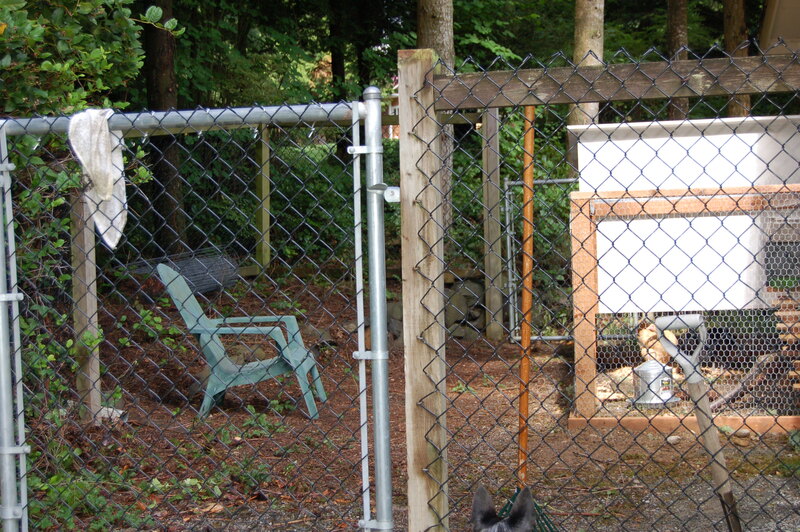 This entry was posted in Homesteading and tagged chicken coop, chickens, free range. Bookmark the permalink. Nancy, does this mean that the chickens might not figure out to use the ladder to get into the coop by themselves? Right now, the remain huddled under the coop (in the rain) instead of going in it where it is dry. Thanks for sharing your chicken experience with me!